Excludes healing abutment and/or restoration. The loss of permanent teeth is a big problem many adults encounter. Many men and women report losing at least one permanent tooth by the time they are forty years old. Tooth loss, if not addressed promptly, often leads to bigger problems like misalignment, embarrassment with the smile, and a loss of facial contours. Most often, dentures or a dental bridge are considered when a missing tooth needs to be replaced. Though these treatments have been longstanding restorative options, they tend to leave patients desiring more. 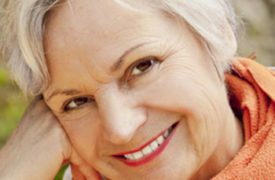 We offer dental implants at our North Hollywood practice as a wonderful alternative to conventional restorative care. Implants are the ideal solution for tooth replacement, looking and functioning so much like natural teeth that even patients cannot tell the difference. More than tooth replacement, dental implants from your Los Angeles dentist are designed to take the place of missing roots. The benefit of this innovative treatment is that the loss of jawbone tissue can be prevented. This is because implants are situated within the jawbone where, over time, they become fused to healthy bone. This process allows the most natural structural integrity, which cannot be accomplished with any other type of tooth replacement. Many of the patients we have treated with dental implants say they forget their replacement tooth is not completely natural. Implants are essentially tiny columns, or posts, made of strong, corrosion-resistant titanium. In a gentle procedure, the exact number of posts needed to accomplish the desired outcome is strategically placed for optimal support. A single implant may be inserted for the replacement of one tooth or a few teeth, topped with a crown or dental bridge, or several implants may be placed to act as a support for your denture appliance. This proven restorative treatment is designed around your needs, to keep you in your best, most functional smile. The implant procedure is performed by Dr. Elzayat after thoughtful discussion and careful planning. Our patients are treated with a high standard of gentle, compassionate care to ensure their comfort through this procedure, which is performed with local anesthetic. Following treatment, temporary restorations may be placed on front teeth if needed, so that you never go without teeth. Within a few months of placement, implant posts will be fused with healthy bone for permanent, solid support of replacement teeth. With dental implants, you never have to worry about the gums becoming irritated due to an ill-fitting denture. You will not experience the embarrassment of a denture slipping when you eat, smile, or speak. 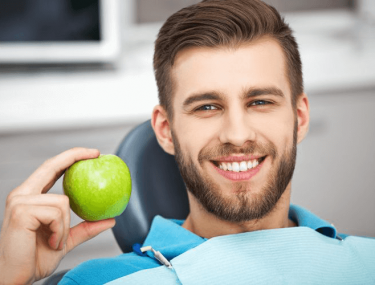 You will be able to continue eating all of your favorite foods, and, best of all, you will feel fully confident in your new smile. 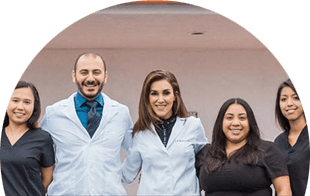 Contact our North Hollywood dental office for your consultation at A-Dental Center.